Got in very late last night from Edmonton. Crazy weather had us sitting on the runway for a couple of hours, after an hour delay. Actually, it's because they were worried about lightning. The people who tuck the suitcases into the plane won't play in the lightning - can't blame them - so, we sat. I am all caught up on Nurse Jackie. And Come Fly With Me, which is the newest offering from the Little Britain guys, which made me laugh because it's about being in an airport. And an airplane. And I was. So. 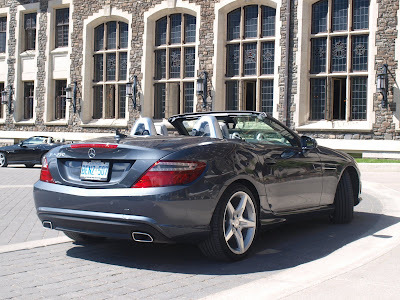 We were driving the 2012 Mercedes SLK - sooooooooo purdy. 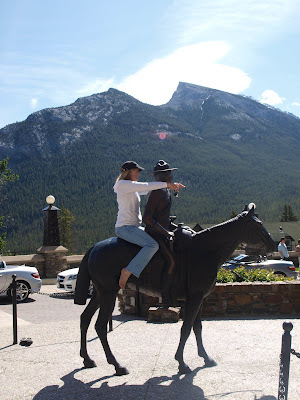 We ambled through Banff and got close enough to beasts to pet them, but we didn't. With the top down on the glorious little two-seater, you really do feel like you own a little piece of the world, at least for a little while. Actually, my driving partner, Lesley Wimbush and I spent the whole time looking for cowboys. What can I say. She owns a horse. I like cowboys. We were in Alberta. Didn't seem like much of a reach. Except, those cowboys are slippery little bastards. Tough to find. They must have seen us first. Did find one, however. I climbed right up, and he asked for directions. What? You want to see what the car looks like? Oh. Alright. Here ya go. I am in Paris and came within a hair's breath (OK I have no idea what that means) of buying a little Eiffel tower key chain for you. But first of all I thought that seemed... well... I don't know... trite, I guess. And second of all I have no idea how to get it to you. So no key chain for you. I hope you picked up a Banff key chain. Or Elk antler. Or something. One day I will figure out which Tim Horton's you are close to and leave something there for you. Like an SLK. But smaller.